Guest edited by Laura Ishiguro, Histories of Settler Colonialism assesses the possibilities and limitations of new imperial and settler colonial approaches in British Columbia’s history. The articles featured examine histories of colonialism and imperialism in a wide range of ways, and consider how British Columbia’s colonial history might be p/repositioned by using and troubling these frameworks. 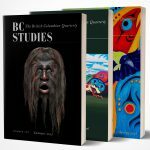 How do the questions of new imperial history and settler colonial studies open up new analytical pathways in British Columbia?How might we work through, across, between, and beyond these approaches? And how might doing so enable us to understand British Columbia’s history as local, regional, national, imperial, and/or transnational in new ways? Tony Ballantyne is a Professor of History, Director of the Centre for Research on Colonial Culture and the Pro-Vice-Chancellor Humanities at the University of Otago. He has published widely on the cultural history of the British Empire and the relationships between imperial and global histories. His most recent sole-authored book is Entanglements of Empire: Missionaries, Maori and the Question of the Body (Duke and Auckland University presses, 2014). Heather Devine is a historian and heritage professional whose pub- lications, research, and teaching specialties include Canadian Native history (with a particular focus on Métis ethnohistory), museum and heritage studies, and western Canadian ethnic history. She has worked in consulting and curatorial capacities with the Archaeological Survey of Alberta, the Royal Alberta Museum, the Nickle Arts Museum, and the Canadian Museum of History. She is author of The People Who Own Themselves: Aboriginal Ethnogenesis in a Canadian Family, 1660-1900 (University of Calgary Press, 2004), winner of the Harold Adams Innis Prize for 2004-05. Fae Dussart is the co-author, with Alan Lester, of Colonization and the Origins of Humanitarian Governance. Protecting Aborigines across the Nineteenth Century British Empire, published by Cambridge University Press in 2014. The meaning and constitution of British, imperial and colonial identity, and the intersection of these with the formation of spaces and places, are major themes of Fae Dussart’s teaching and research. These have focused on domestic service in nineteenth century India and Britain, and on humanitarianism and colonialism in the British Empire. Laura Ishiguro is Assistant Professor in the Department of History at the University of British Columbia. Her research examines the history of British Columbia and the British Empire, with a particular focus on the relationship between settler colonialism, affect, and the everyday. She is currently completing a book on trans-imperial British families and the foundations of settler colonial British Columbia in the “long” nineteenth-century. Madeline Rose Knickerbocker is a white settler scholar and PhD candidate in the Department of History at Simon Fraser University. She is currently completing her community-engaged dissertation, which examines connections between cultural heritage curation and sovereignty activism in Stó:lō communities during the twentieth century. Madeline researches and teaches Indigenous and Canadian histories focusing on: politics and activism; feminism, gender, and sexuality; material culture, heritage, and commemoration; and oral history and community-engaged research methods. Sarah Nickel is a Tk’emlupsemc (Kamloops Secwépemc) Assistant Professor in the Department of Indigenous Studies at the University of Saskatchewan. Her areas of research include twentieth-century Indigenous politics and activism, Indigenous women’s politics, Indigenous feminisms, community-engaged research, oral history/ ethnohistory, and direct action/protest/resistance. Sarah is currently working on her manuscript, Negotiating Unity: Indigenous Politics and the Union of BC Indian Chiefs, 1969-1983 to be published with ubc Press. Sarah’s next project, Indigenous Women and Politics in the West will look at Indigenous women’s politics and activism in British Columbia and Saskatchewan during the late twentieth century and will use an Indigenous feminist lens. Adele Perry is Professor of History and Senior Fellow at St. John’s College, University of Manitoba. She is the author of a range of work on western Canadian, comparative colonial, and gender history. Perry’s most recent book is Aqueduct: Colonialism, Resources, and the Histories We Remember (Winnipeg: arp, 2016) and she is working on a study of fur trade governance and the nineteenth-century British Empire. Sabina Trimble is a second-year MA student in the Department of History at the University of Victoria. For her SSHRC-funded thesis project, she is building a digital, ethnohistorical map of The’wá:lí’s reserve and traditional lands. The project is an ongoing collaboration with members of the community that began as a course project on 2013 Ethnohistory Field School among the Stó:lō (jointly coordinated by the universities of Victoria and Saskatchewan). A map of the Stó:lō community of The’wá:lí’s will be made publicly available online in autumn 2016. Graeme Wynn is a professor of historical geography at the University of British Columbia and editor of BC Studies. This is his last issue. He has taught and written extensively on environmental history. Dr. Wynn has researched the development of New World societies and the environmental impacts of European expansion around the world, including in early Canada and colonial New Zealand. He is general editor of the Nature/History/Society series at UBC Press, and was for six years co-editor of the Journal of Historical Geography (published by Elsevier), He is a Fellow of the Royal Society of Canada, and was the Brenda and David McLean Chair of Canadian Studies at the University of British Columbia between 2011 and 2013.